CHICAGO—(ENEWSPF)—February 4, 2017. Following on the heels of an enormously successful meeting last month featuring Congresswoman Jan Schakowsky and other progressive leaders, the Democratic Party of the 49th Ward is hosting another public meeting, this time featuring Colleen Connell, Executive Director of the American Civil Liberties Union of Illinois. The event is free and open to the public. Join us Monday, February 20th, 7:00 p.m., at the Loyola Park Fieldhouse, 1230 W. Greenleaf (at the Lake). The ACLU is in the forefront of the battle against Donald Trump’s ban on Muslim immigrants and is gearing up to fight Trump’s inevitable encroachments on our other freedoms and liberties, including a woman’s right to choose. Learn what the ACLU is doing to safeguard our hard-fought freedoms and how you can help. Going to meetings and learning more about the issues are great to do, but we also need people to ACT to stop the worst excesses Trump. Here’s one thing you can do. Right now Trump and the Republicans in Congress are threatening to gut the Affordable Care Act, also known as Obamacare. If they are successful, millions of Americans who currently receive health care insurance will lose their coverage. The 49th Ward Democratic Party is teaming up with Congresswoman Jan Schakowsky to apply pressure to Republican Congressmen in swing districts in Illinois to leave Obamacare alone. 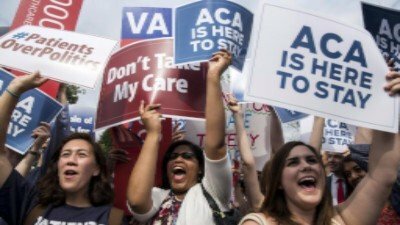 We are running a phone bank out of the 49th Ward Democratic Party Office, 1774 W. Greenleaf, every Tuesday, Wednesday and Saturday, from 3:00 p.m. to 7:00 p.m. to encourage voters in swing districts to contact their Congressional representatives and urge them to vote against any effort to repeal the Affordable Care Act. Won’t you join us? Sign up here to help. With more than 12 million Americans depending on Obamacare for health insurance, you can find Obamacare supporters in every congressional district in the country. If you can spare even one hour on a Tuesday, Wednesday or Saturday from 3:00 p.m. to 7:00 p.m. you’ll have a huge impact. Please bring your cell phone for calling. If you have a laptop or tablet, bring that too so we can get more people calling. No experience is necessary. You will have a short training and our phone bank coordinator will help you with any questions. Sign up here to help.